To complement our major exhibition 'The Sixties Are Back' our artworks of the month from May to October feature photographic portraits of well-known popular music artists of the decade by Fiona Adams. Collaborated with Andy Warhol and the Velvet Underground. 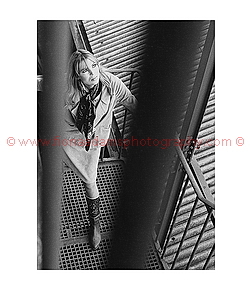 "This shot is Nico making her way up to my studio. I was a bit embarrassed about people having to make their way up this open iron stairwell, but on this occasion it made an interesting backdrop." Listen to Fiona Adams talking about this photograph. The work of Guernsey-born photographer, Fiona Adams captures the spirit of the 1960's. She is most well known for being the photographer behind the cover of the Beatles 'Twist & Shout' EP, their first to be released in Britain. Adams left Guernsey to study photography at the Ealing of School of Art then went on to work as assistant to the eminent portrait photographer Douglas Glass. Following this, Adams spent two years in Australia turning her hand to an array of photographic genres including travel, advertising, news, documentaries and wildlife. The buzz of London in the early 60's was something Adams could not ignore however, and she returned from Australia to be given a job with the London based pop magazine Boyfriend. It was while working for Boyfriend that Adams was given the assignment to photograph the Beatles, who were only just making a name for themselves. Rather than sticking to a straight forward studio shoot, Adams and the Beatles headed out of her cramped studio and took a taxi to Euston Road. Here the landscape was still scarred from the air raids of the Second World War. Adams was always looking for unusual and experimental backdrops, and this desolate rubble-ridden landscape caught her imagination. The combination of the young and energetic 'Fab Four' and an innovative young photographer resulted in the iconic 'Twist and Shout' EP cover. Jon Savage, the music journalist and broadcaster, wrote an essay for the publication Beatles to Bowie which accompanied the National Portrait Gallery's exhibition of the same title. Within this essay he wrote about Adams' 'Twist and Shout' photograph, which was just one from a collection of her work included in that exhibition. Savage pointed out the significance of Adams' choice of backdrop. It was as if the band was rising from the ash and rubble of an old Britain. Adams continued to work with Boyfriend until she was invited to join a new magazine Fabulous. This enabled her to continue to capture many of the celebrities on the London scene, when the 60's were really 'swinging'. While working there, Adams did find her creative and artistic talents thwarted at times, stating with some annoyance that many carefully composed photographs would be cropped to the standard head shot during the editorial process. Her talent for capturing the interesting and unusual was therefore often lost on the cutting-room floor. As the 60's made way to the 70's, the spirit of that era faded. The optimism of 60's London made way to the pessimism and scepticism of the 70's. Psychedelia and free love had not provided the answers, and Flower Power made way to Glam, Punk and an increasing drug culture. Sensing a change in the air, Adams moved to New York. She made a conscious decision to move away from the pop and celebrity scene, and began working as a travel photographer for American Express. Fiona Adams now lives back on Guernsey, returning after her many travels with her husband while also bringing up her two children. Her specialisation in pop photojournalism over the six years working in London has earned her the accolade of being one of the most significant and prolific in that field. The audio link below is a recording of Fiona Adams talking about this photograph.